Jump to your folders instantly. Folder Scout is a very useful application that gives you instant access to any Drive, Folder or File on your computer. Folder Scout avoids everyday tedious folder tree navigation and searches allowing you to focus on just your important tasks. 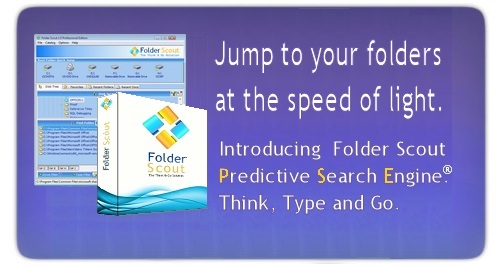 With its high speed search engine you can access any folder on your computer just by typing a few letters of its name. Use a powerful tool to easily manage thousands of folders. Thanks to its Predictive Search Engine browsing and finding your computer folders will be child's play! NOTE: Software piracy is theft. Using a Folder Scout crack, password, serial number, registration code, addon, patch or keygen is illegal and prevents future development of Folder Scout. You may even get a virus instead of the crack or code generator you hoped to find! © Copyright 2019 Folder Scout Labs.